The three-year-old son of Amanda and Moses Minton died this date, September 8th, in 1849 and was buried at Bethel Burying Ground. The three-year-old unnamed son of Amanda and Moses Minton died this date, September 8th, in 1849 of Scrofula* and was buried at Bethel Burying Ground. At the time of their son’s death, Ms. Minton (34 years old) was employed as a laundress and Mr. Minton (49 years old) was employed as a porter, earning $6 a week, according to the 1847 Philadelphia African American Census. The family of nine lived at 17 Emeline Street for which they paid $5.25 a month. Siblings of the dead three-year-old were James (17 years old ), who also worked as a porter, David (9), Anni (7) and Amanda (4), according to the 1850 Federal Census. The other two members of the Minton family were not identified. Mr. and Ms. Minton were both born in Virginia, while all their children were born in Pennsylvania. The red arrow indicates the location of Emeline Street (now Kater). The purple arrow indicates the location of the Bethel Burying Ground. Emeline Street was a short, narrow thoroughfare that was crowded beyond its limits with African American families. The street was home to forty-six families, totaling one hundred seventy-one men, women and children. The adults were employed in jobs that serviced the well-off white families in the area and at the stores they frequented. Emeline Street was the address of carpenters, coachmen, private waiters, barbers, dressmakers, seamstresses and “Ladies Maids.” Half of the families lived in shelters in the rear of the houses that faced the street. Interestingly, the census taker for the 1847 Philadelphia African American Census commented that the families that did not live in the shanties were “doing well.” He or she had no comment on those in the shacks and the converted animal stables in the backyards. The Mintons’ son was buried on a “fair day” with a high temperature of 68 degrees and a “drying wind” out of the north. Mr. Minton would succumb to stomach cancer in 1860 at sixty-four and Ms. Minton to kidney disease at seventy years old in 1874. Emeline Street does have an awful place in Philadelphia history. It is stated that there was never a lynching of an African American in Philadelphia. That is because the white mobs would either shoot or beat to death their Black victims. This was the case on October 10, 1871. Musician Isaac Chase, thirty-four, had the gall to try to vote at his polling place when a gang of Irish thugs chased the young man back to his home at 811 Emeline Street. Chase made it inside but his front door was kicked opened and, in front of his spouse and children, Samuel was shot in the head and killed. *Scrofula is a condition in which the bacteria that causes tuberculosis causes symptoms outside the lungs. This usually takes the form of inflamed and irritated lymph nodes in the neck. The two-year-old unnamed son of Charles Savage died this date, September 1st, in 1847 and was buried at Bethel Burying Ground. 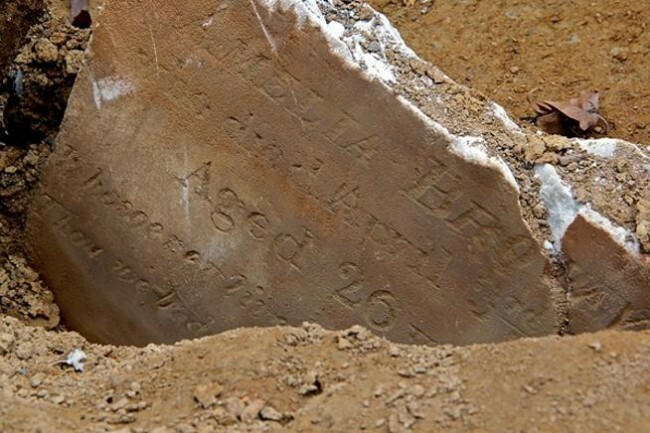 The unnamed two-year-old son of Charles Savage died this date, September 1st, in 1847 of a chronic stomach inflammation and was buried at Bethel Burying Ground. The name of the child’s mother was not recorded. Mr. and Ms. Savage had three other children – one under five years old and two between the ages of five and fifteen years old, according to the 1847 Philadelphia African American Census. There was also another unidentified female adult who was part of the family. Mr. Savage was employed as a driver of a furniture cart, earning $5 a week. Ms. Savage was a homemaker. The three adults were not born in Pennsylvania, while all the children were native of the state. The family of six lived in a 12’x12′ room in Church Alley, a short narrow back street near the Delaware River. They paid $4 a month for the small, poorly ventilated space. The children in the Savage family attended Jonathan Tudas’ private school on Hurst Street, several blocks from their home, according to the 1847 Census. The Savages’ two-year-old son was buried on a humid, rainy day in September of 1847. The 1850 Federal Census has no mention of a “Charles Savage” in Philadelphia that fits the information in the 1847 Census.